This is known as the Euthyphro Dilemma because both explanations lead to unsatisfactory conclusions. 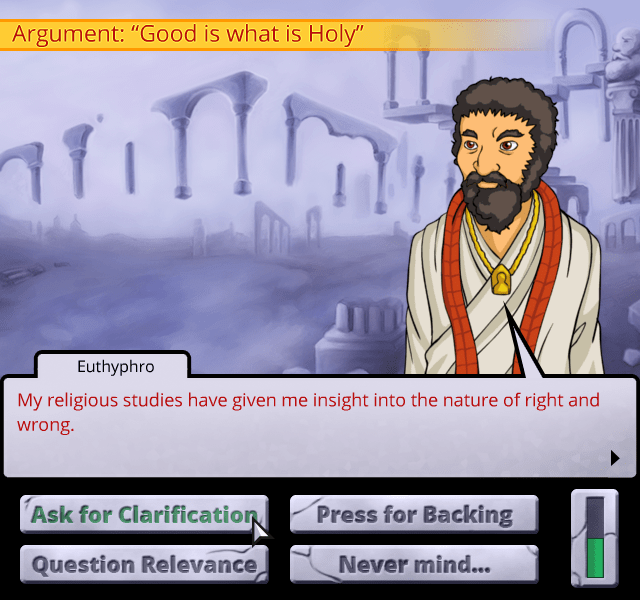 If something is loved by the gods “because it is holy”, then Euthyphro must explain why, which he is unable to do. But the larger problem is that if it is holy, pious, or simply good apart from the gods, this means that this truth is somehow more fundamental than the gods. Therefore, the gods acknowledge, not determine, the objective truth. In this way, they are subservient to what is holy, and that is hardly befitting a god. The second option, that something is “holy because it is beloved of the gods” also gives pause. This means that the holiness or goodness is somewhat arbitrary or subjective. It is what the gods happen to like. The conscience of most people seems to argue otherwise: right and wrong is not decided by anyone, but goodness is an objective standard. At asyourpoetshavesaid.com, we typically write about spirituality in popular movies, TV, and literature, so I cannot help but think of a line found in Harry Potter, when the villian Voldemort states, “There is no good and evil, there is only power…and those too weak to seek it”. In this way, he seems to agree with the second option from the dilemma, that might (i.e. the gods) makes right, but I hope most of us would disagree with him. About five hundred years after Plato penned this dialogue, a Galilean fisherman named John solved the Euthyphro Dilemma with three simple words: “God is love” (1 John 4:8,16). God is the objective standard. It means that goodness/holiness/piety is not the subjective fancy of the divine, nor is it greater than the divine. It is the divine. John did not merely say that God is loving, but that He is Love incarnate. Hence, goodness is that which is consistent with God’s nature. Note that we did not switch to monotheism incidentally. There are not multiple objective standards of goodness, but one. In the dialogue, Socrates points out that the gods often disagree, so they cannot all be the same objective standard. Hence, “God”, not “gods”, is love. Thus, Plato’s argument leads us to the conclusion that if the divine exists, it cannot be independent gods1, or persons, but one personal God. As the remainder of this post deduces the nature of the divine based on the idea that God is the objective standard, we must first determine if this standard of goodness exists. To do so, we can use a modified version of the Euthyphro Dilemma, saying that “good is that which is loved by humans”. But do humans love goodness because it is good, or is it good because humans love it? In other words, do humans acknowledge that something is good fundamentally or is it made good by humans? The latter is fraught with the same problems in the dialogue: not all humans agree and Voldemorts “might makes right” notion is instinctively wrong. So, we turn to the former, that humans acknowledge (or fail to acknowledge) that something is good fundamentally. But this means that the goodness is fixed apart from us. That is a problematic conclusion for a god, but not a human (unless the human wants to think of themselves as god). Hence, the objective good fundamentally exists apart from humanity. Why can’t goodness simply exist as the objective standard and not as a person? After all, we don’t normally think of love as a person. Let’s start with the axiom that love is the objective standard that encompasses all of goodness2. We’re not speaking of romantic love, but more broadly of the Greek term, agape. At a minimum, this can be defined as willfully valuing the welfare of another person, i.e. benevolence or altruism. Many things in this world are beneficial, such as my comfy recliner that I sit in while writing blog entries, but I would never say that it loves me3. It’s not a person, but an object, and objects don’t love. Most would also argue that democracy benefits society, but it would be equally silly to say that democracy loves us, showing us that concepts don’t love either. If love exists as the objective standard, then a person must exist to do the loving. If the divine is love itself, then the divine must be a person because only persons love. Michael Reeve’s Delighting In the Trinity not only explains the rationality of the Trinity but showcases His Beauty as well. While I feel the argument is more obvious if we equate the objective standard to love, it still holds if we see it as moral goodness. Again, my chair is good, but not objectively so. Nor is it willfully good. Moral goodness has intention to it, and intention requires that it comes from a person with a will. Just as one needs to be a person in order to love, i.e. to be the lover, one needs another person to love4. (Failing to understand this truth cost the Jedi dearly, but President Whitmore of Independence Day embraced it.) Someone might respond, “Yes, love requires a beloved, so God creates us.” But, this would mean that God needs us in order to be Himself. That would not only make Him dependent on His creation, it is incoherent. How could love not be love? Similarly, what would He be prior to the existence of humans? How could love become love? 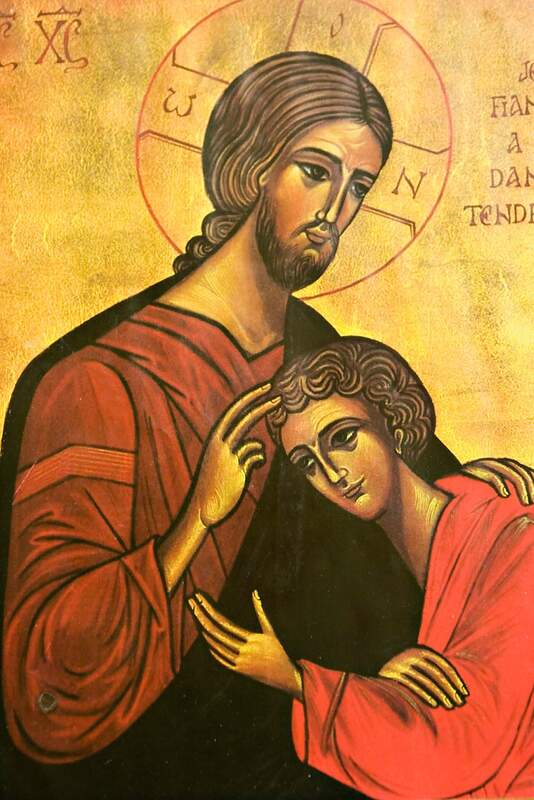 No, for God to be complete and independent of anything but Himself, He must be eternally the lover and beloved, which John and more importantly Jesus identified as the Father and the Son. So, why the Holy Spirit? One argument is that God’s love is not an exclusive love, only between two persons, shutting others out. Instead, His love is inclusive. Michael Reeves writes in Delighting in the Trinity, “But when the love between two persons is happy, healthy, and secure, they rejoice to share it.” As before, God does not need a creation to share the love between Father and Son. From Plato’s dilemma, we can conclude that the divine is at least three persons5 who are in their essence the one and only objective standard of goodness. But why not more than three? If we reasonably assume that a God defined by love would seek to make Himself known and share that love, then some world religion would match these conclusions. To my knowledge, only6 the Trinity satisfies the Euthyphro Dilemma. Hence, the divine comes into focus as Father, Son, and Holy Spirit. Let’s summarize. From Plato’s work, we have deduced much about the nature of the divine. First, it is the objective standard of goodness, which exists apart from us. This requires that this divine is personal: not one or two, but at least three persons who are the one standard of goodness, love incarnate. Consequently, the Trinity is the best description of God found in the world. “Father, I want those you have given me to be with me where I am, and to see my glory, the glory you have given me because you loved me before the creation of the world… I have made you known to them, and will continue to make you known in order that the love you have for me may be in them and that I myself may be in them” (John 17:24-26).